Chaplin is a shareholder in the firm. Chaplin joined the firm in 1998, and is the fourth generation Spencer to practice law at the firm. His areas of practice include local government, banking, creditor-debtor, corporate law and complex commercial and government litigation. 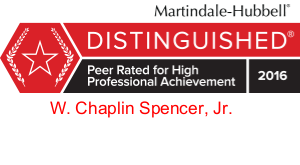 Prior to joining the firm, Chaplin served as law clerk to the Honorable John C. Hayes, III, Sixteenth Judicial Circuit of South Carolina. Research Editor, American Bar Association Real Property, Probate and Trust Journal, 1995-1997.